Employee Health, Fun, Productivity By Nora Inveiss on September 30, 2015 . When hunger strikes at work, it’s easy to be tempted by the convenience and deliciousness of that donut sitting in the breakroom. While tasty and enjoyable in the moment, you might regret it later – snacks that are high in sugar are harmful to your health in the long run. There have been countless studies that link refined sugar to heart disease, weight gain, and numerous other health issues. Added sugar also affects your productivity. While eating sugary foods may make you feel full and give you a boost of energy, it’s only temporary. You will crash and then you’ll feel lousy and lethargic. Not to mention sugar is addictive. Like a drug, it conditions your body to crave more. I don’t deny myself junk food when I crave it – I believe in moderation and don’t hesitate to indulge every now and then. But it’s important to maintain a balanced diet and eat healthy throughout the day to keep energy levels up. Foods that are higher in protein and vitamins, and have a moderate amount of carbs are great for just that. Here are some healthy snack ideas for work. They’re good for you, easy to transport, and most importantly, they taste good. Nuts have a lot of protein, fibre, and essential fats. Due to their higher fat content, a golf ball-sized portion should be enough to keep your energy going without being unhealthy. Each nut has its own nutrients and fat levels, so a great way to get a good balance is by making a trail mix. You have a lot of different options to keep things interesting. Just remember to avoid salted nuts as that increases sodium levels. Adding chocolate keeps things sweet, and studies indicate that dark chocolate is even good for you! Dried fruit is also a popular add-in, but beware: those can be high in sugar and aren’t as healthy as you may think. 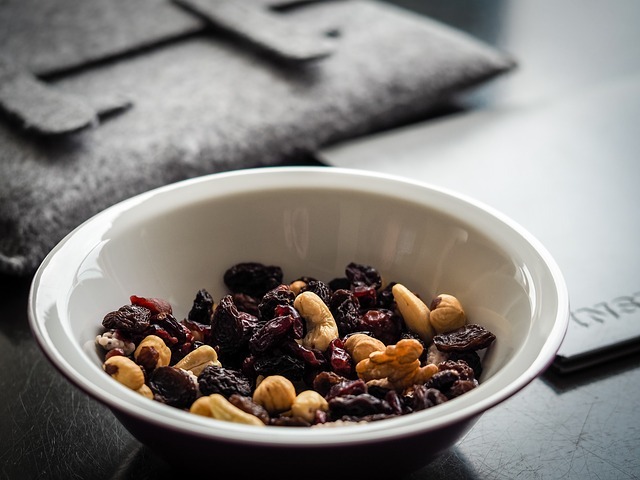 Tip: My favourite trail mix is a blend of almonds, peanuts, cashews, raisins, chocolate, and shredded coconut. Hummus is not only delicious, but it’s also super healthy. Its main ingredient, chickpeas, are high in protein and fibre, and have been said to lower cholesterol. Combine that with vegetables, which are also high in fibre and nutrients, and you have a snack jam-packed with health benefits. Try dipping broccoli, bell peppers, carrots, celery, cucumbers, or cauliflower. The key is to eat an assortment of veggies (this also goes with fruit), as each vegetable has different nutrients. Tip: It’s easy to make your own hummus. All you need is a food processor, a can of chickpeas, tahini, olive oil, garlic, and some optional spices. Recipe from Jamie Oliver here. Yogurt is packed with potassium, calcium, and protein. It also has probiotics – “good” bacteria that help with digestion and protect you from harmful bacteria. However, some yogurts are high in sugar. Don’t be fooled by the low-fat label, either. Those are packed with more sugar to make them taste better. The best option here is to go for a plain greek yogurt. Add a touch of honey or maple syrup to make it sweet and throw in some chia or ground flaxseeds for extra fibre and fatty acids. Granola also adds some extra flavour and crunch, but its healthy reputation is questionable. 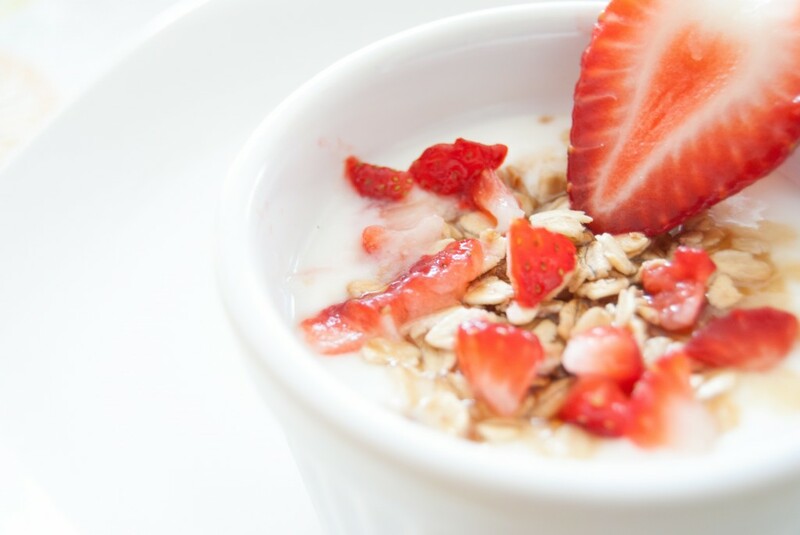 Opt for a granola that’s higher in fibre and lower in sugar. Tip: Mix yogurt with flax seeds, honey, and a sliced up banana. Eating fruit is a great way to satisfy your sweet tooth. It’s rich in vitamins, fibre, and carbohydrates (the good kind). 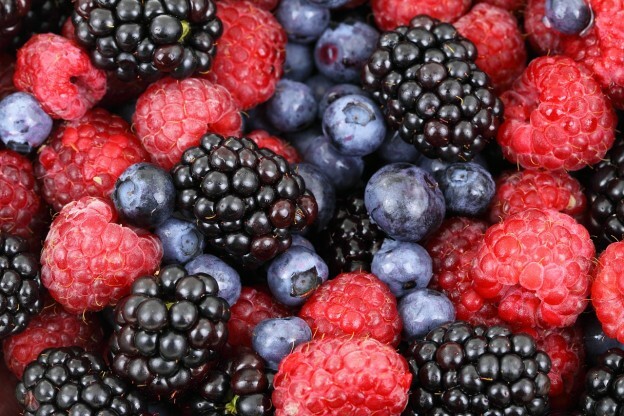 Fruits like blueberries, bananas, and strawberries are considered superfoods (more here), meaning they have nutrients and antioxidants that make them extra good for you. As fruit has high water and fibre content, eating it will make you feel full with less calorie intake. Tip: Whole wheat toast with peanut butter and blueberries is delicious. Whole wheat bread will help fill you up, peanut butter is a great source of protein, and blueberries cover the vitamins. 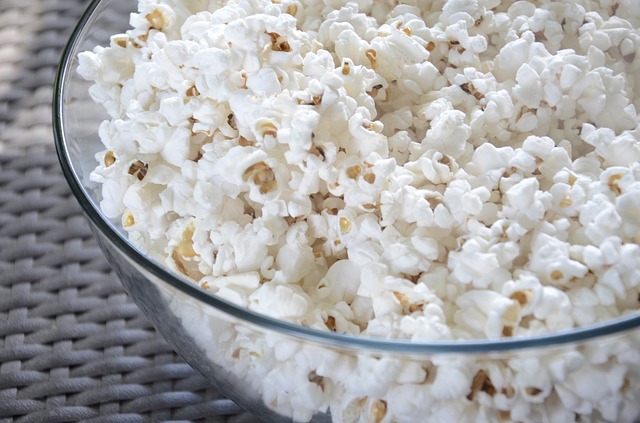 Popcorn is perfect for salty cravings – as long as you don’t buy the movie theatre or microwaveable stuff, which is drenched in butter and salt. Popcorn is considered a whole grain, full in fibre and antioxidants. Make it yourself at home – either with an air popper or on a stove top. Tip: There are so many ways to add flavour to popcorn. You can add a pinch of salt or experiment with myriad other spices and toppings: garlic powder, curry powder, paprika, tarragon, finely grated parmesan, cinnamon-sugar, and more. Maintaining a healthy diet isn’t just good for you physically, but also mentally. Eating snacks throughout the day keeps your energy levels up and productivity high. And you don’t need excess amounts of refined sugar to have a tasty snack – there are plenty of options out there that can satisfy your cravings without making you crash.